Early on this day of the Karmapa’s visit to the Nepali community in Aldershot, the double arch of a luminous rainbow filled the sky. It recalled his first visit to the US when rainbows followed him everywhere on the East Coast. The Karmapa was invited by the Buddhist Community Centre UK to this beautiful area of England, famous for its military garrisons and home to a sizeable population of Gurkha soldiers who have served in the British army. In 2006 they were allowed to live in England and in 2007, the Buddhist Community Centre UK was founded by Mr. Kaji Sherpa. He had the vision of establishing a Buddhist monastery to serve the growing Buddhist Community in this southeast region of the UK. His daughter explained that about half of the Gurkha population in Nepal is Buddhist, and that her father felt a need for Buddhist guidance in this community, so a committee of Nepalis purchased a social club and completely transformed it into a Buddhist monastery. 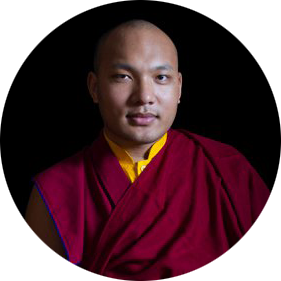 Their organization has about 200 members, who helped to plan and execute two events: the Karmapa’s visit to their center this morning and a long-life empowerment at the nearby Lakeside International Hotel in the afternoon. 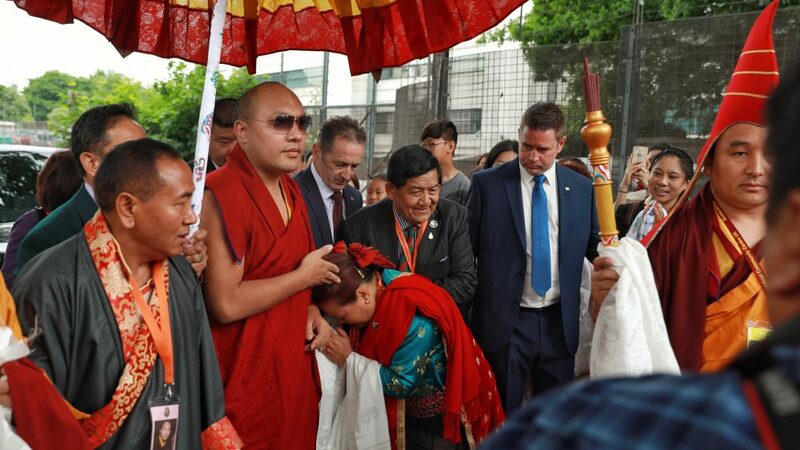 On his way into the shrine hall, the Karmapa stopped in front of the center to participate in the unveiling of a special stone, engraved in honor of his visit with the five precepts of moral behavior. He also blessed a Buddha statue and Bodhi stupas, whose layers had been decorated with bouquets of bright spring flowers. His Holiness then entered the shrine hall where some 300 people were chanting “Karmapa Khyenno” and took his seat on the throne before a statue of Guru Rinpoche. The Chairperson, Lt Narayan Gurung MBE, welcomed the Karmapa and spoke about the activities of the BCCUK, which include religious celebrations, hosting teachers, periods of meditation, groups for children and the elderly, environmental education, and relief work, such as sending aid during the great earthquake in Nepal. Extending the support of the Nepali community to those who have suffered so greatly in England, at 11am a moment of silence was observed in memory of the tragedy in Manchester. On behalf of the people gathered for this special occasion, the Chairperson thanked the Karmapa for his visit and invited him to speak. His Holiness told of how happy he was to be able to come and extended his warm greetings to everyone. He had waited a long time to visit England, he said, and though he could only be here a short time this day, he would try his best to fulfill everyone’s wish. What is most important, he explained, is making a deep Dharma connection with the many Buddhists here in the community. He encouraged them to invite good teachers to the center and maintain their ancient connection with Tibet. After his brief remarks, generous offerings were made for the Karmapa’s long-life, and all the members had the chance to offer a khata to His Holiness. Before lunch with a large group of followers, he stopped for rest and refreshment at a cottage by the lake where Nepal’s national flower, the rhododendron, blossomed and three swans glided over the surface in their quiet elegance.